Vase of classical shape with two handles at the shoulder. 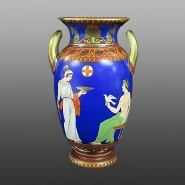 The vase is printed in black with conventional borders and central scenes of classical subjects that are colored in bright enamels against a royal blue ground. A title cartouche is printed on the base with the pattern name "VICTORS OF PUBLIC GAMES fulfilling their Vows in the TEMPLE of VENUS", together with a fractional pattern number of 3 over 9113. Although this piece is not marked by the maker, other examples are known with the initials S. A. & Co. for Samuel Alcock & Co. whose factory is known to have used large fractional pattern numbers. A similar vase on this site has the makers mark and name Copeland, however this factory did not use fractional pattern number of this kind in the 1850s.